Mention motocross to your average road-rider and his toes will curl up in horror. The sport of the young, they’ll say. Fearless 18 year-olds bashing bejeezus out of themselves and each other as they clear enormous double jumps and smash their bones to bits. Good to watch on the telly sometimes, but ride in it myself? Moi? You must be bloody joking. Well they couldn’t be more wrong. 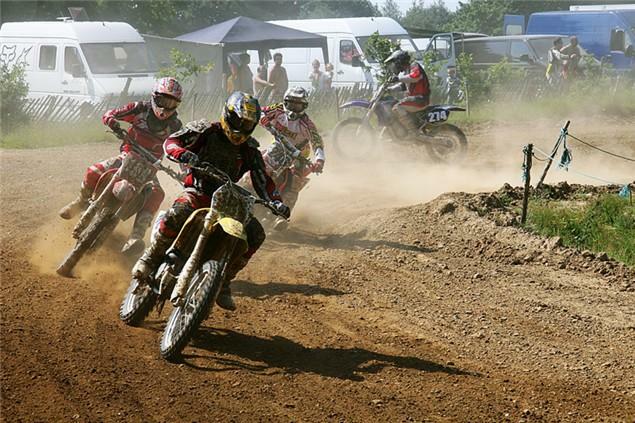 Club Championships are indeed taken extremely seriously (and quickly) by just such youth, but the truth is that there’s a huge pool of old gits (‘veterans’ is the official term) racing motocross this year right across the country, and it’s the most fun you can have with a mate on a motorcycle. I’m racing a Suzuki RM-Z250 all year with the Portsmouth and Southern Motocross clubs and it’s been hilarious. I’ve won a race, taken home the trophy and haven’t even crashed yet. Not properly. A typical meeting consists of practice, qualifying and then you’re drafted into your race category: D is slowest, A is fastest. After that you get three races throughout the day and I promise you will go for a piss every 10 minutes before your race begins as the nerves kick in. More than any other form of two-wheeled motorsport, you’ve got to be fit to race motocross. If you’re not fit, you won’t be able to hang onto the bike after two laps. Racing motocross is the single best way of getting bike-fit on the planet, and it’s the single best incentive for getting fit in the first place. It’s a mix of cardiovascular and body-pump, and just six laps will leave you ragged and gasping for breath. Go running for 20 minutes three times a week and do some light weights to get in shape. There’s never been a better reason to give up the fags. 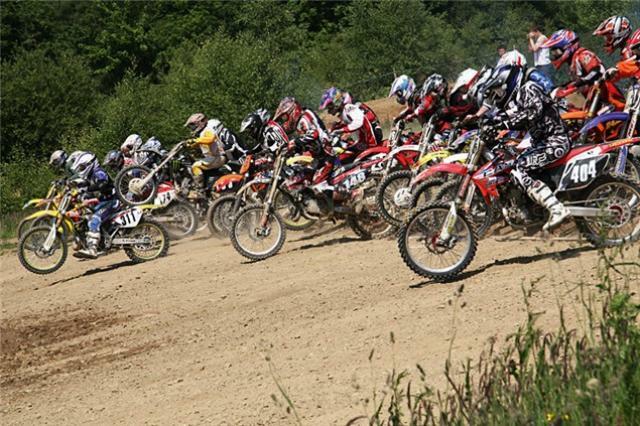 Unlike road-riding the impacts in motocross (should they happen) are much lower at club level. If you do have a topple you’ll be going down on loose dirt or mud, and therefore you really don’t need a brand new £400 Arai to protect your brain, nor replace it after you’ve had your tumble. This helmet is a particularly disgusting old Lazer held together with Gaffa tape and it’s still okay for racing. Goggles can be found in anyone’s cupboard, old ski goggles are fine. Don’t spend £120 on iridium Oakleys until you’re very, very good. 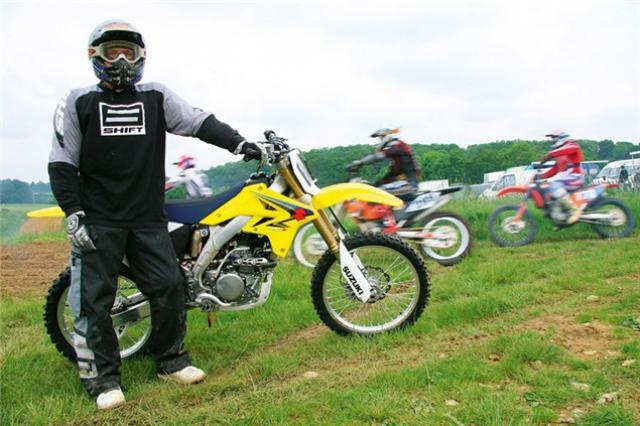 Motocross bikes aren’t registered, don’t have warranties and can’t really be insured – so they’re cheap! To start with you don’t need to spend any more than a grand for a 125cc two-stroke. They’re cheap to buy and maintain, although for this kind of money they’ll be well-used and probably need a new piston kit or suspension overhaul. If you can’t be arsed with this (and let’s face it, who can?) then you’re better off spending twice the money on one of the new-breed of 250 four-strokes. So long as they’ve been properly serviced and had regular oil-changes they should be mechanically sound, and these bikes are the perfect mix of easy power and light weight. Motocross bikes come in for a lot of rough and tumble so expect scratched plastics, but it’s obvious what’s been looked after and what’s a complete shitter. We’ve even seen £600 DR400Zs being raced that are perfect for a first-timer and can be sold for what they’re bought for. Stay well away from 250 two-strokes or 450 four-strokes unless you want to scare yourself stupid. Everyone has a mate with a van or a bike trailer. I’ve managed to convince my motocross buddy to keep my bike at his place and since he’s got the van he ferries it back and forth to meetings. Alternatively fit a bike rack to the back of your car. They only cost £60 and bolt to the tow-hitch on your car. I’ve seen a BMW M3 with a CRF450 on the back so even flash gits can do it. Try www.davecooper.co.uk for info on bike racks. Apart from your helmet, this is your most important buy as they support your ankles when you land wrong. So long as you’re happy to put your feet in someone else’s cheese you can pick up a pair of used Alpinestars or Gaerne boots for well under a hundred quid, while TCX now offer brand new boots in the £150 range. Amazingly you can buy brand new Axo pants and race jerseys off the internet for less than 50 quid. You want Kevlar panels built into the inside knee for crash protection and so that hot exhausts don’t burn through the nylon. It’s important to buy your bike before you buy your kit so you don’t get Suzuki yellow clashing with your Kawasaki! A set of tyres will last you four races at most, then they’re done. You can soldier on with your knobblies ripped off but you’ll spend more time spinning than going forwards. Maxxis have made a big push into UK motocross tyres and are readily available at all meets, but we prefer Michelin Starcross of Bridgestones. This is the best part of racing motocross at club level. Unless you have a monumental crash all you need to do is put gas in the tank between races and bolt on new brake or clutch levers after a tumble. And that’s it. We’ve been racing all season and have so far needed a Phillips screwdriver – once. There are hundreds of motocross clubs across the UK, which operate on either a ‘turn up and race’ basis or you have to be a member. Annual membership is generally around the £100-mark and each meeting will be around £35. Clubs in the south are pmxc.com and southernmotocross.co.uk, in Yorkshire there’s beehive.thisishull.co.uk/eastriding-mxc and those in the middle try midlandsocial.co.uk.